The ivory crosier of Ename is an outstanding masterpiece of Flemish Romanesque art. It probably carries a complex and rich symbolism which makes it even more special. 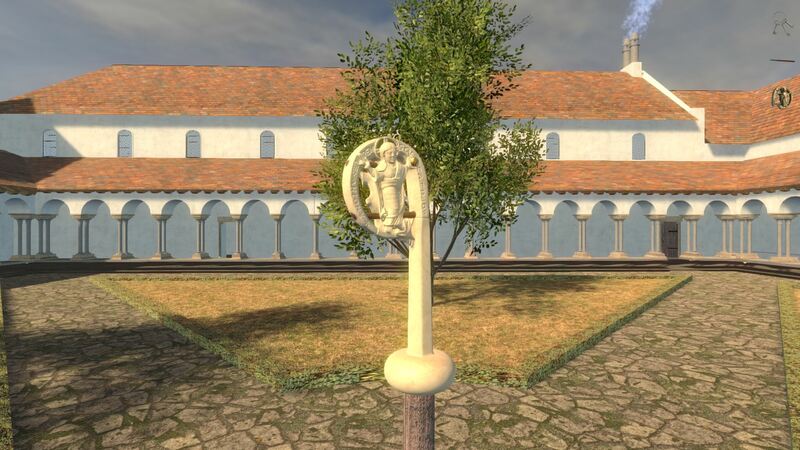 Therefore we have made the crosier the main subject of the Eham 1291 educational game and virtual tour. This game is completely based upon historical facts, but we have taken the freedom to put some causal links between some facts which are not proven by any historical source. For example, we know that at some point, the Ename crosier had been broken, but continued to be used as it has been meticulously repaired. We know also that the local lord remained very long in power, not transferring the power to his son. We link the breaking of the crosier to a quarrel between father and son, although we don’t have any historical proof of that, which is quite normal, even today this kind of information could remain under the radar. 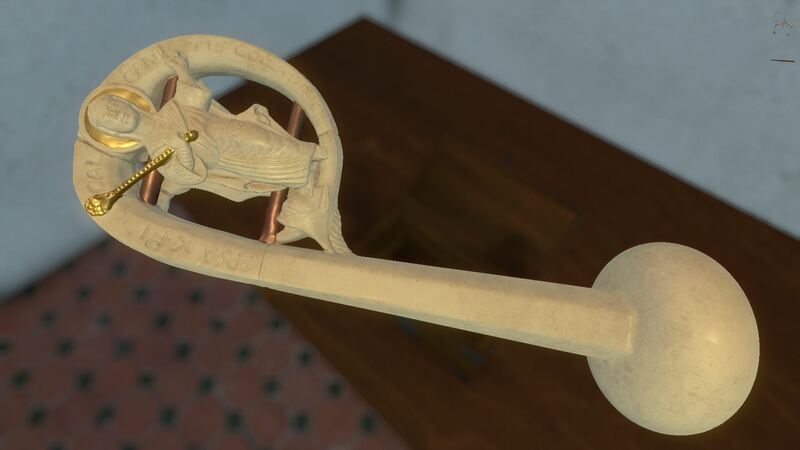 The game is a small quest for the keys of the box, in which the crosier is brought back from the goldsmith who repaired it, and can be played in an hour by a group. 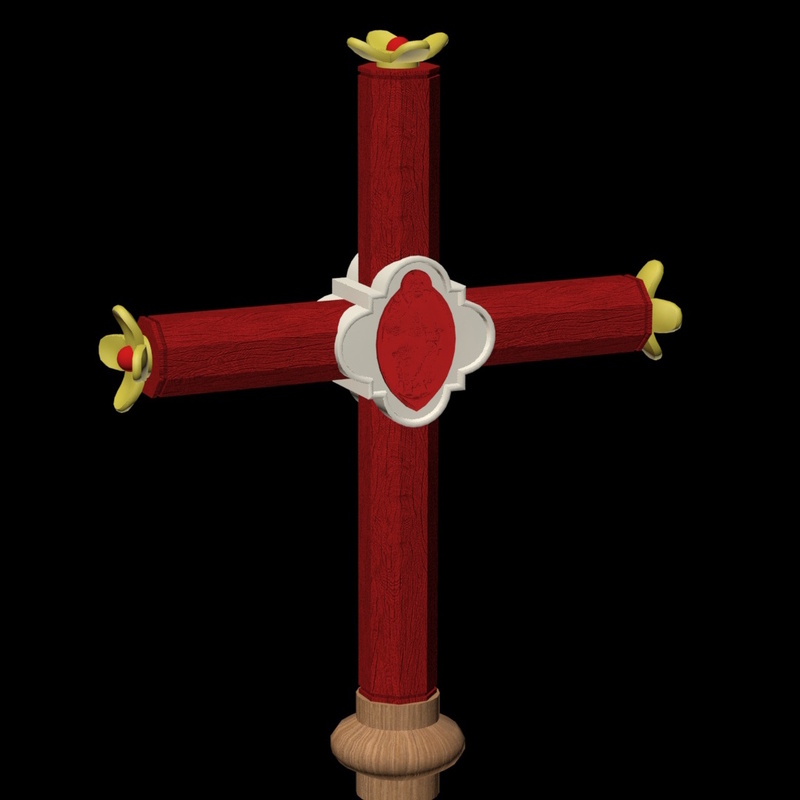 In the game, the symbolism of the crosier is briefly explained. On the front side, Christ as Saviour (Saint Saviour) symbolises the power of the abbot over his monks. 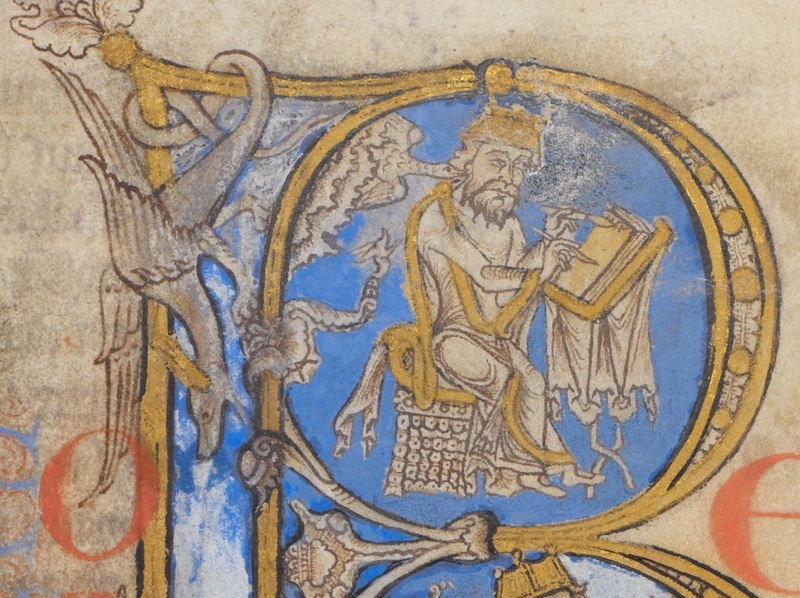 This symbolism is best represented by the 12th century drawing below, showing the abbot as Christ at the Last Judgement (aka Majestas Domini). 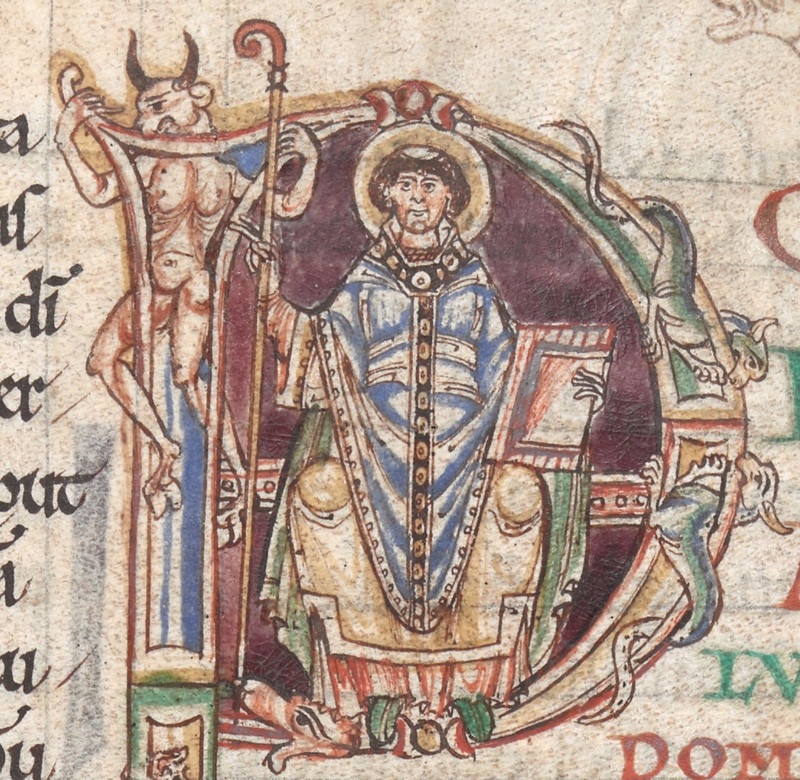 The abbot is holding his staff as the symbol of this power to judge and punish monks (the knob is the the symbol for this juridical power) while the staff resembles the stick of a shepherd (that provides guidance and support for the sheep). Note the biting dragons and caged devil! On the other side, the Bride of Christ carries a lily staff as symbol of virginity, but symbolises also the role of the abbot as caring mother, guiding and protecting his monks. At the same time, she points at the text that probably says “The Bride of Christ, trampling the neck of the dragon”. The dragon is the medieval symbol of the evil in man, so it’s very present in many medieval manuscripts. 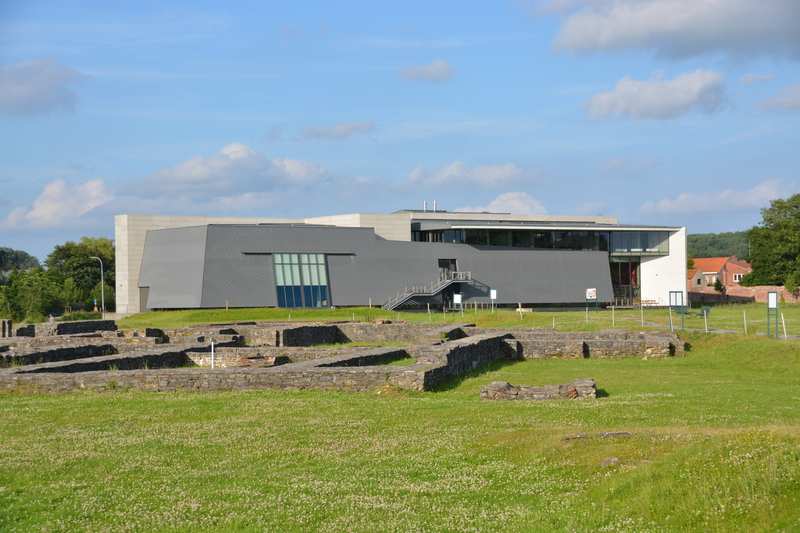 This work has been partially funded by the Flemish Ministry of Culture. 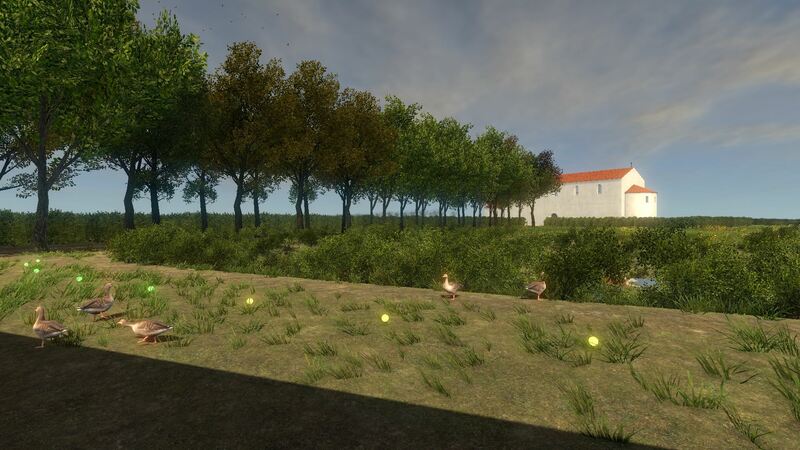 In the first version of the Ename educational game – called Ename 1290 – virtual animals where already present everywhere in the game, having some AI (artificial intelligence). One of the major improvements of the Eham 1291 game is the use of virtual humans. Although no dialogue can be started with these characters, they are influenced by the actions and decisions of the player(s) of the game. We have introduced two kinds of interaction. The first kind are cutscenes, which in fact are small real-time movies that are played out as a result of an action of the player. 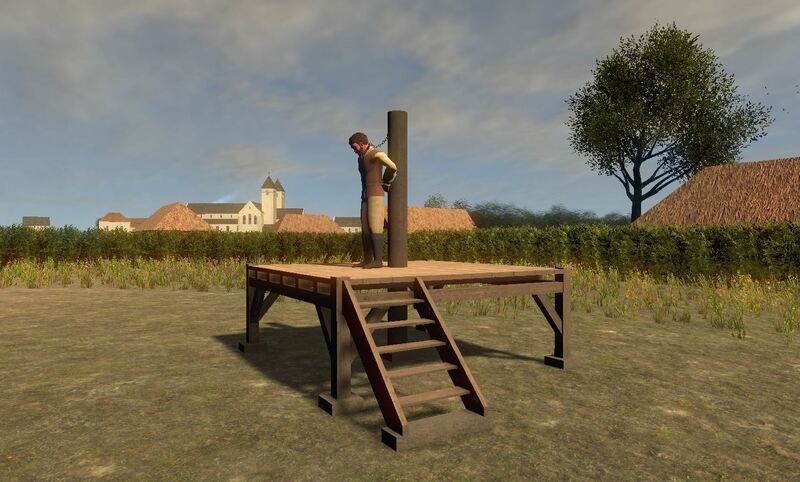 For example, if the player takes a certain object that he should not take away, the player is put at the pillory for theft, resulting in game over. 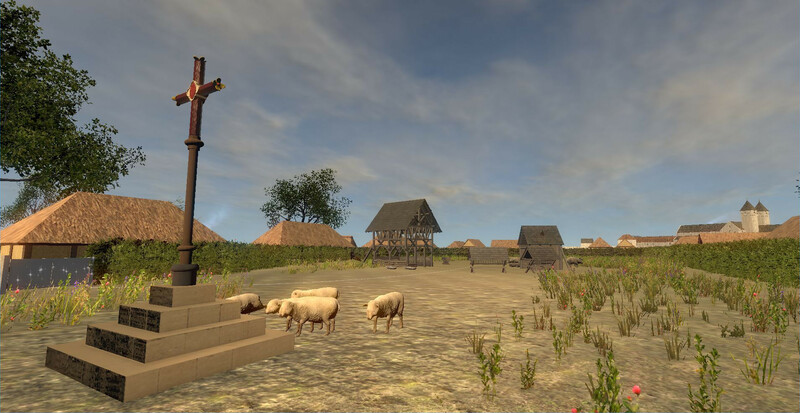 This not only makes the players think about the rules of a medieval world but also shows the strict social control within a medieval village and the medieval juridical system. 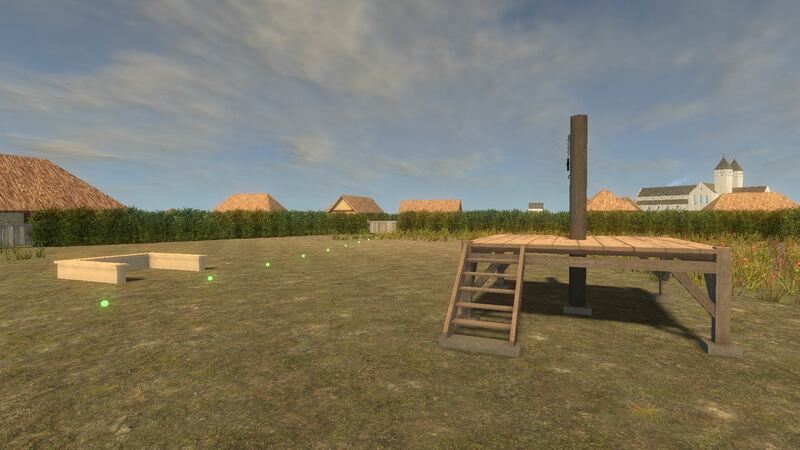 A guide playing this educational game with a group of children – target group for Eham 1291 are 10-12-year-olds – can expand on such aspects as other elements of justice are also visualised in the game such as the open air court benches (vierschaar). In the game, such elements have been constructed in a very readable way. For example, in the timber harbour, the production of timber is shown from beginning to end, so the guides can explain it in a very visual way. The second kind of interactions are changes in the behaviour of NPCs (non-player characters). 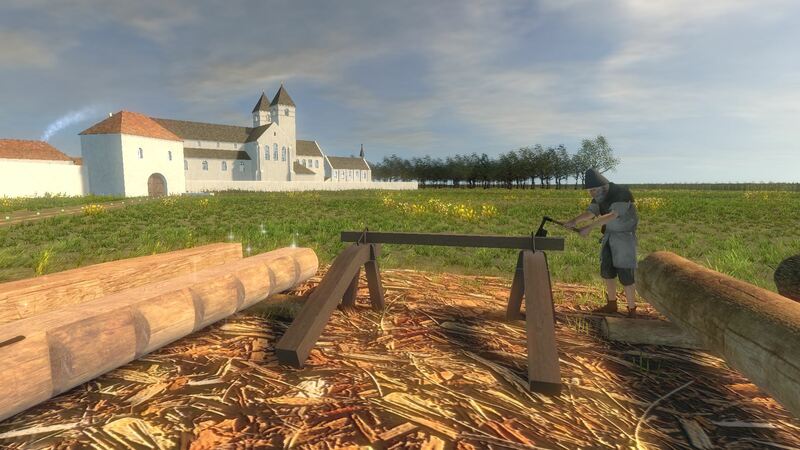 For example, if you try to take the wooden beam the carpenter is finishing at the timber harbour, he will not only blame you for trying to take away this object, but also will give you extra information that is useful later on in the game. Also animals are playing a crucial role in the game. 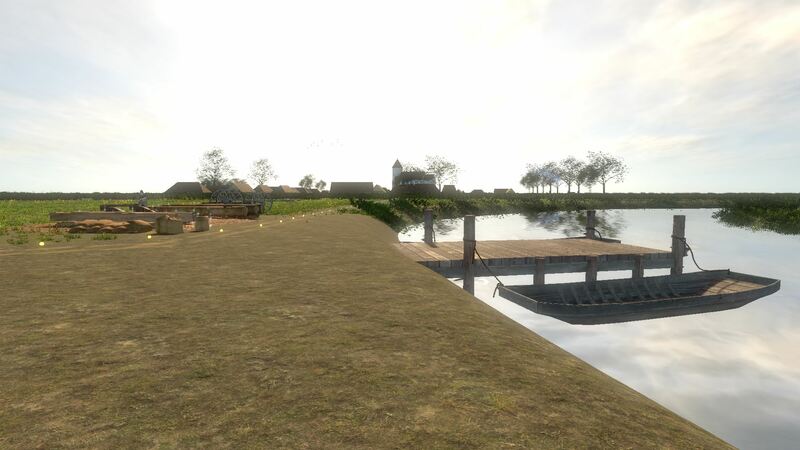 For example, you only get free passage if you can divert the geese that block your way when leaving the abbey farm, without it you cannot finish the game. 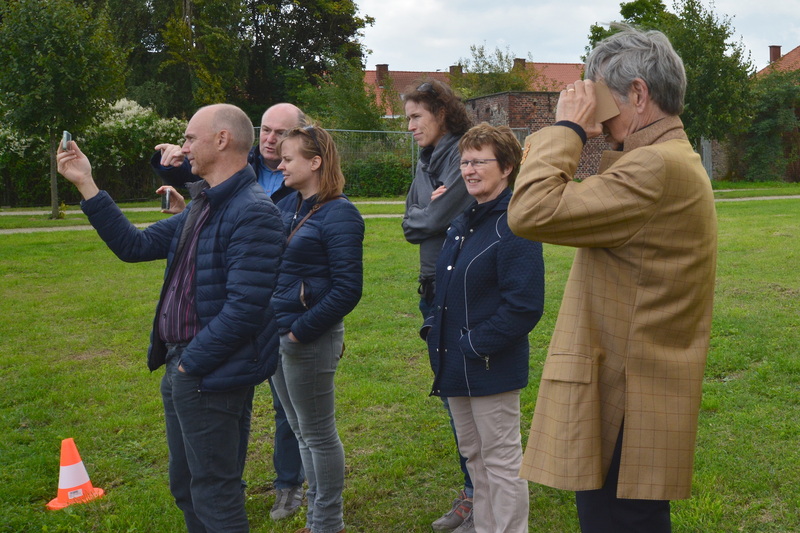 On the recent Heritage Day in Flanders (Sept 10, 2017), we organised a unique guided tour on the archaeological site of Ename, using a virtual reality visualisation of the abbey gardens in 1663 and 1730. Such a VR guided tour is one of the possible ways of providing GroupVR (see also our WTCB presentation earlier this year). 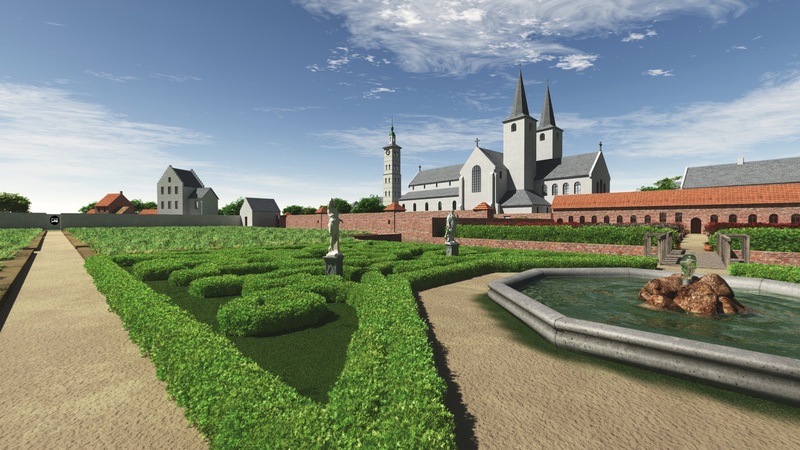 This virtual reconstruction of the abbey gardens in 1663 and 1730 uses spherical panoramas in a large number of points, allowing to go from one virtual location to the other and in this way, walking around in the gardens, admiring its (reconstructed) beauty from different points of view. 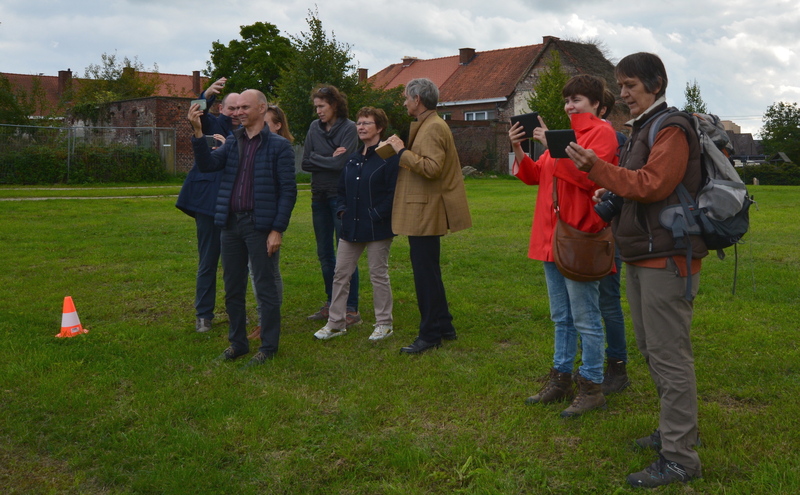 By walking around on the archaeological site in the same way, going from point to point in the physical space (indicated by traffic cones), a guide can explain how the abbey gardens looked like in a certain period, and the members of the guided group can see these virtual features through a cardboard VR viewer (in which they have put their smartphone) or on a tablet. Although the cardboard viewer without strap gives the best results, it turned out that tablets are the easiest to use, as they require less configuration. 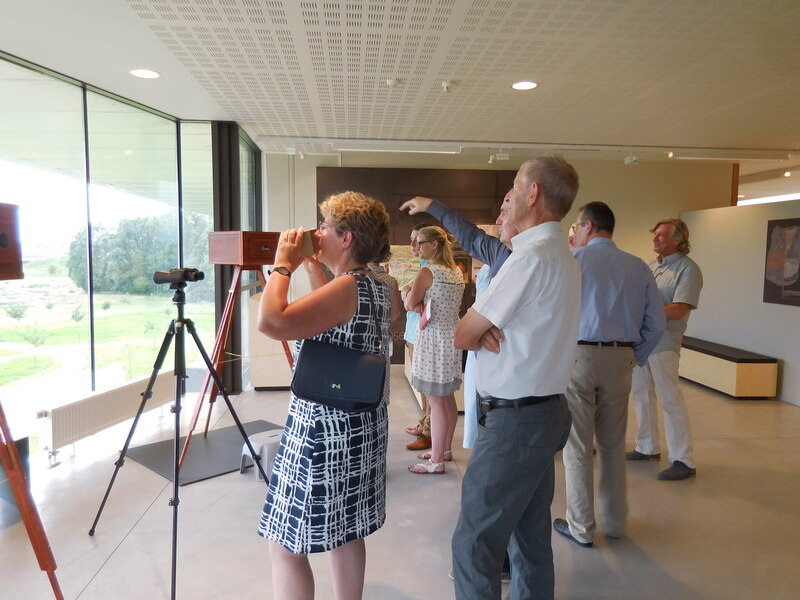 In any case, all participants to the six guided tours were very confident that they were much better experiencing the site and learning about its history. This approach is another way to implement GroupVR and turn 3D and VR into a support for site guides, not a replacement, with the additional benefit of social interaction and better communication between the members of the group. 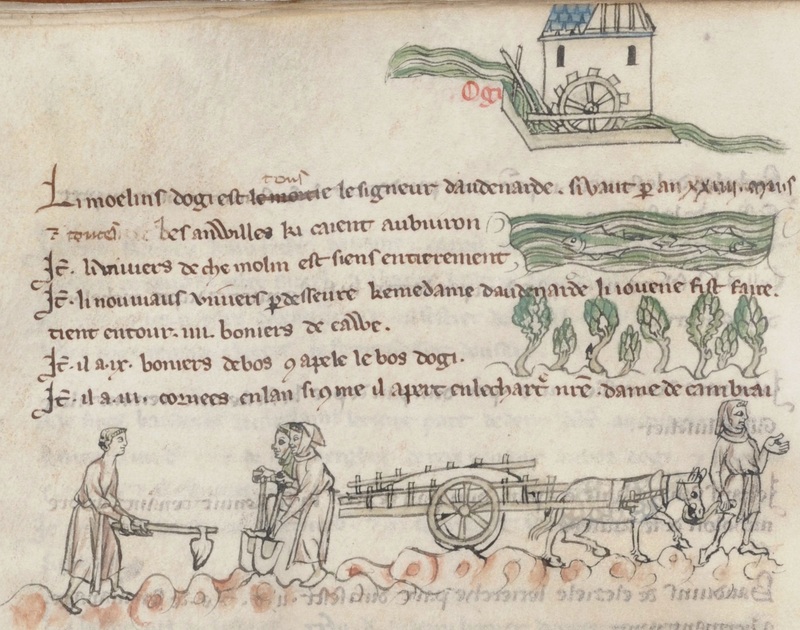 In the last 5 years, many outstanding medieval manuscripts have been made accessible in a digital way, for example at national libraries such as Bibliothèque nationale de France (BnF) or British Library. 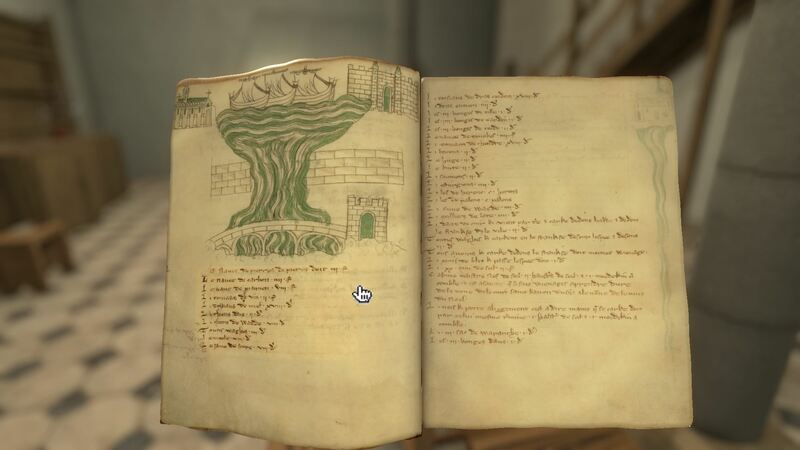 Also the Royal Library of Belgium has digitised many outstanding manuscripts that are of paramount importance to our research for 3D virtual reconstructions (as can be seen in this blog). 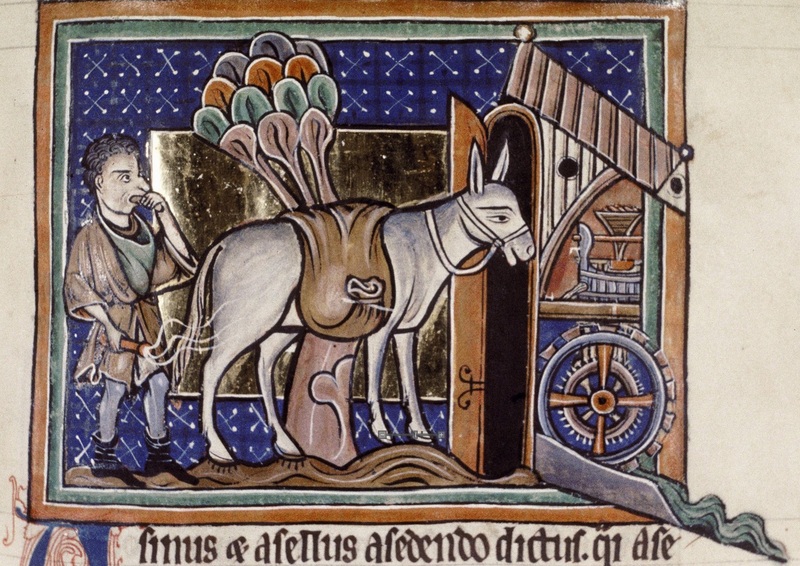 One exceptional document is the Veil Rentier, a rent book describing the properties of the lord of Oudenaarde and the rent for each parcel or service (such as transport, water- and windmills). The document resides currently in the Royal Library in Brussels. 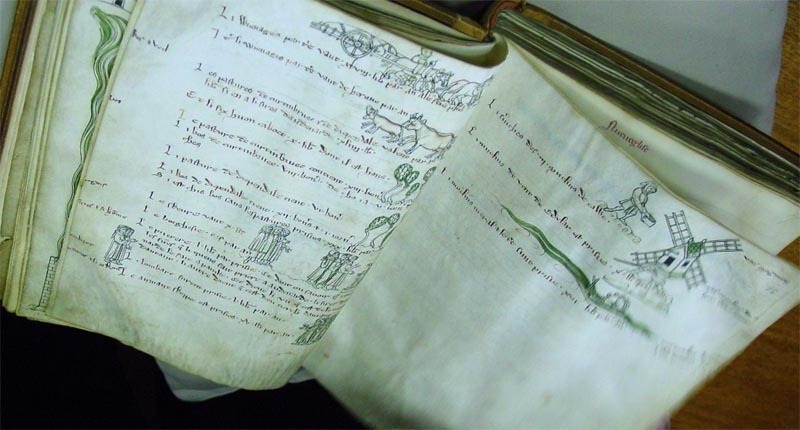 This medieval document, written in 1275 and updated and illustrated around 1290, is exceptional for two reasons. First of all, it contains a wealth of drawings depicting daily life, specific sites and objects (for example the market cross that we reconstructed and documented in this blog). Secondly, it is a secular document from the 13th century, one of the very few that have been preserved, giving insight in the secular real estate and customs of that time. For these two reasons, the full document has been translated in Dutch and published in 2011. 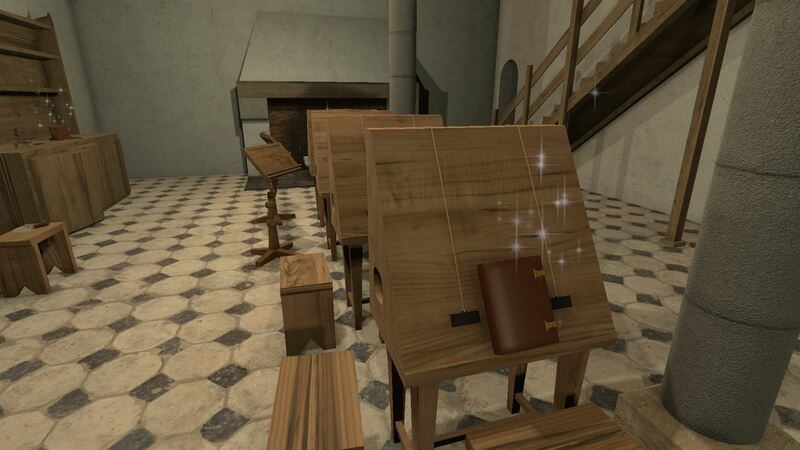 As the book has been updated and illustrated around 1290, possibly in the Ename abbey, we have added the book to the Eham 1291 game, putting it on one of the desks of the scriptorium. With gestures only, a museum visitor can take the book, open it, browse through it (from folio 5 to 15) and read specific parts of the text (one hears that part of the text in modern Dutch), using the available translation by Businarias. 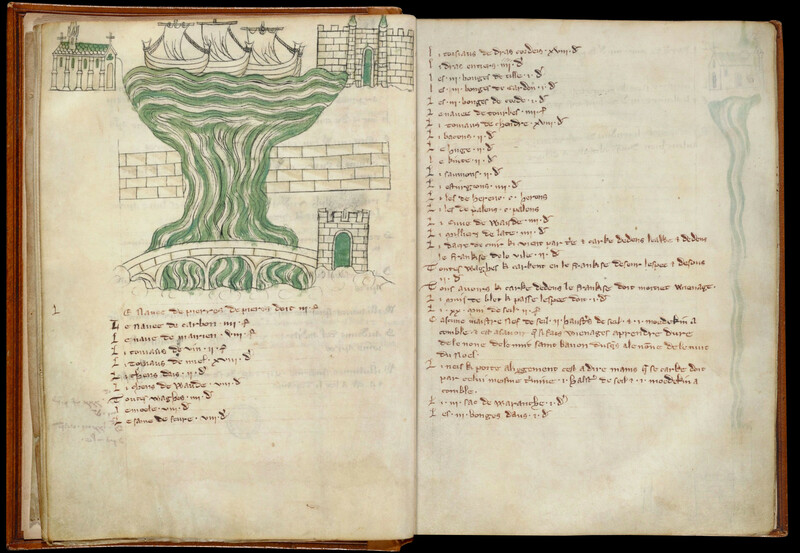 In this way, we not only allow the general public to look at this outstanding manuscript and enjoy its unique illustrations, but also understand and appreciate the text, that provides an unprecendented window onto the daily live in Ename and its surroundings in 1290. This new TimeGate application helps the museum not only to provide a better context for the museum objects and the archaeological site, but also to provide interactive and intellectual access to manuscripts in digital libraries, which are considered to appeal to experts only. 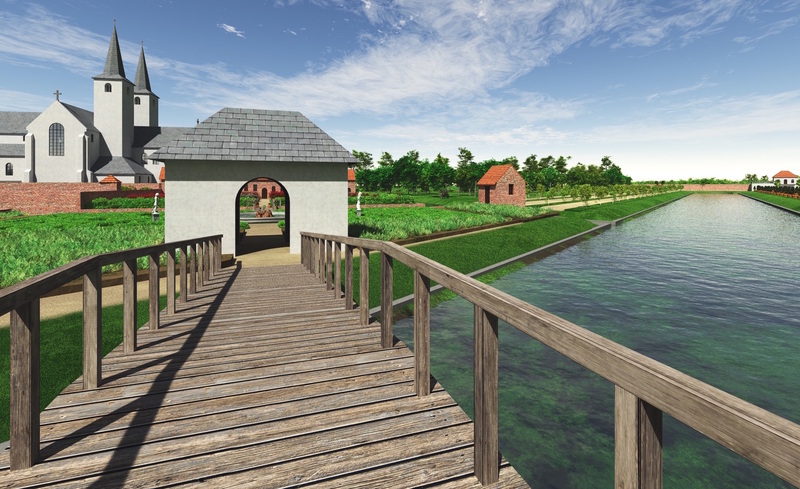 As the museum visitor using this Eham 1291 application can also visit virtually a reconstructed windmill and watermill, these constructions depicted in the Veil Rentier get again an appealing and rich context. 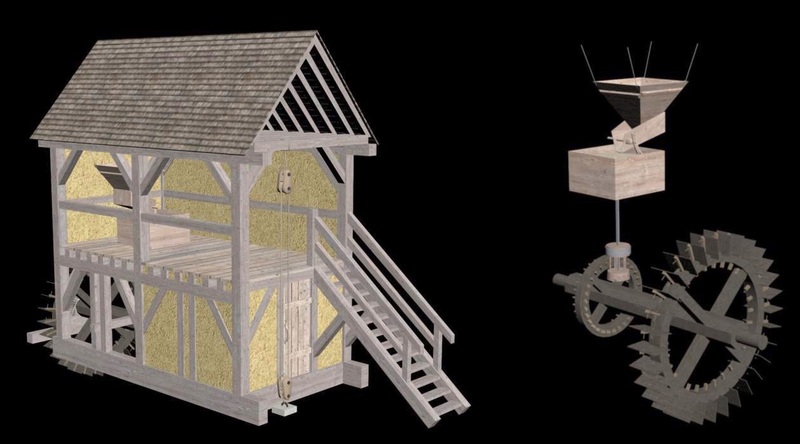 Again, these virtual reconstructions allow to bring both archaeological results and images from digital libraries to the wider public, such as the splendid depictions below of a medieval watermill in manuscript from 13th and 14th century. 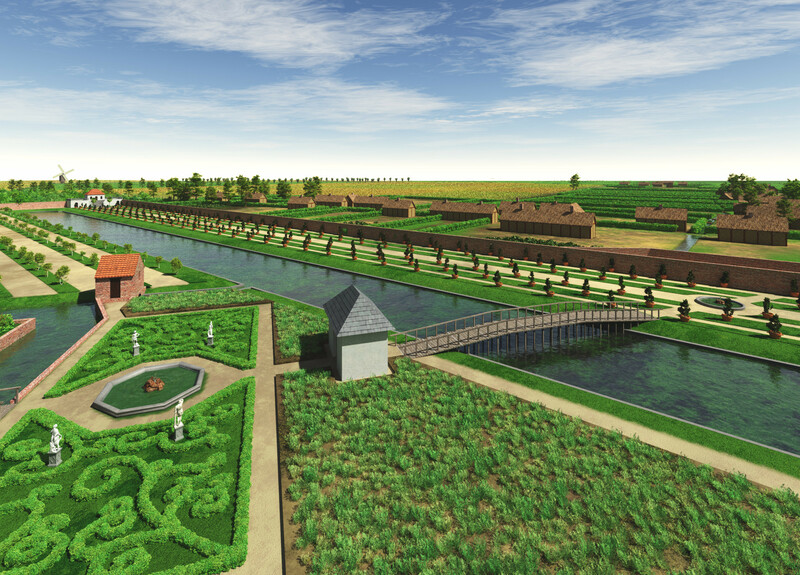 We recently made a virtual reconstruction of the Ename abbey gardens in 1665 and 1730, which is now available onlien and in multiple forms in the context of the free exhibition Old Love at the Ename Heritage Centre. 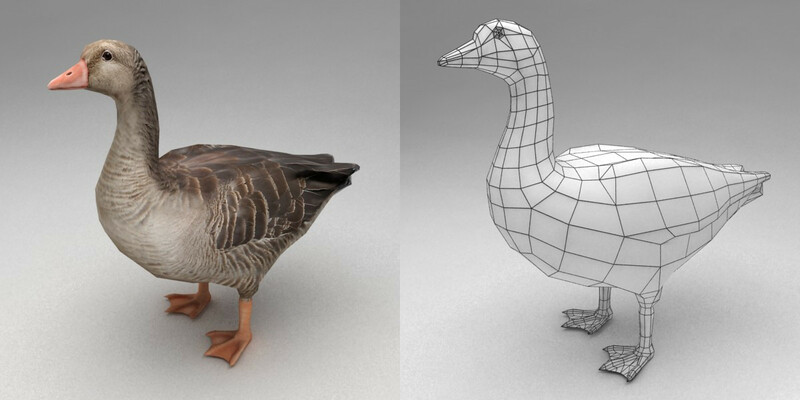 The 3D virtual reconstruction can be superimposed on the real landscape by looking through “peep boxes” containing a transparant 3D print of the reconstruction. 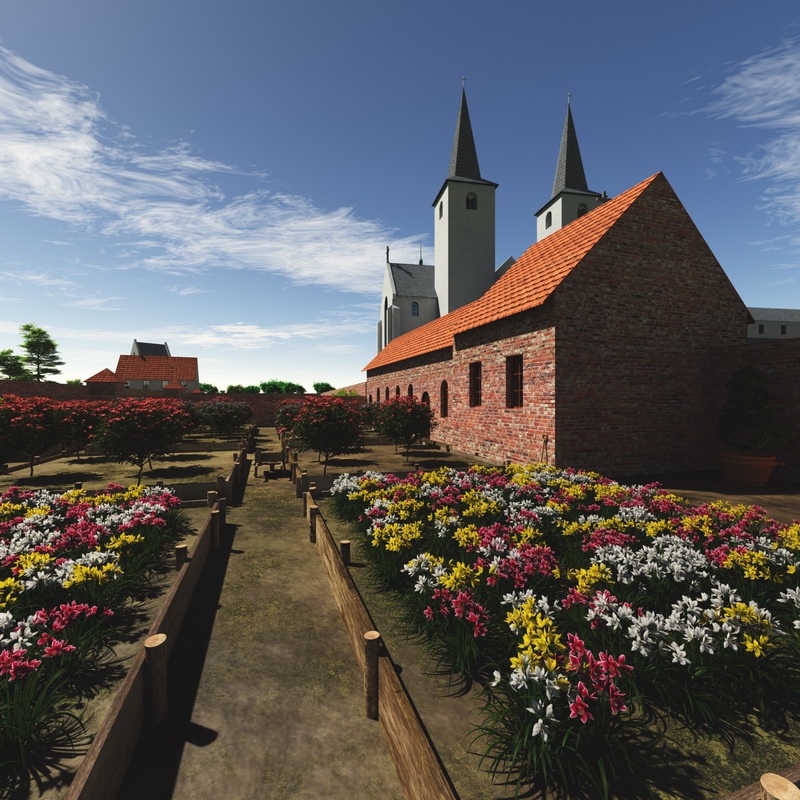 Additionally, an interactive walktrough of the abbey gardens in 1665 and 1730 can be experienced with any VR headset and any tablet (and can be viewed also on any desktop). 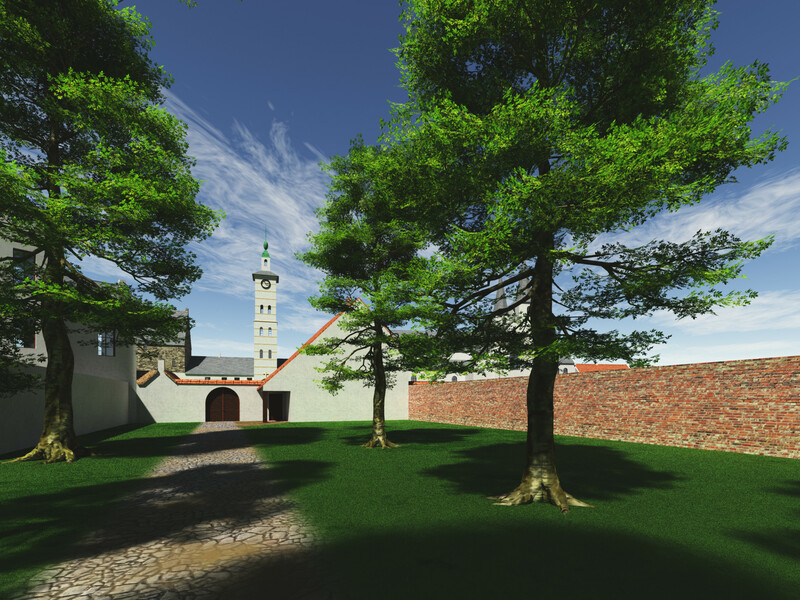 Here is the 1665 tour on VR headset and tablet or desktop (for the headset version, push START on both sides before you put your smartphone in the cardboard viewer). 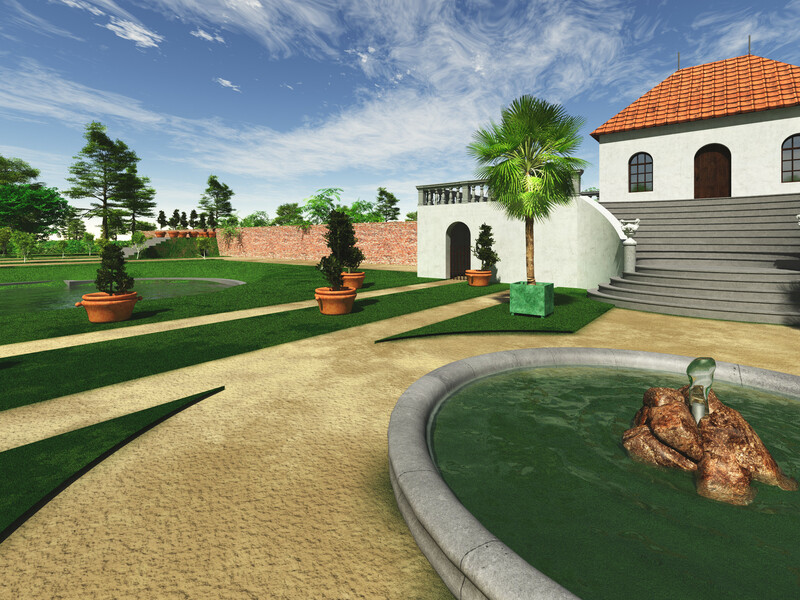 And here is the 1730 tour in the new French gardens of the abbey on VR headset and tablet or desktop. 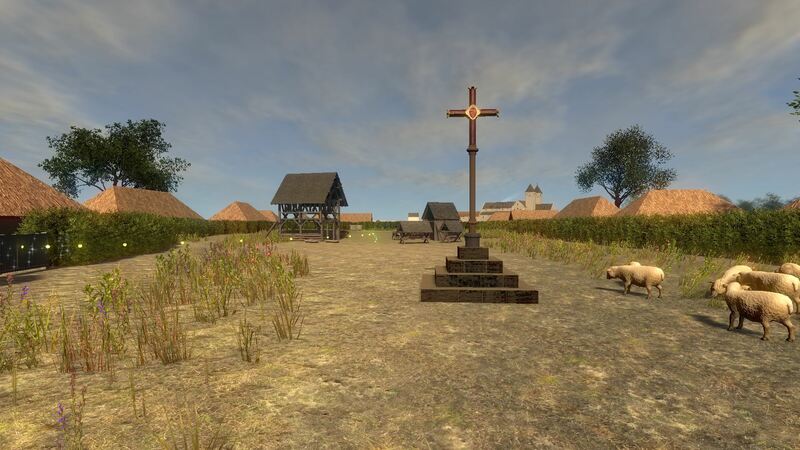 In the Middle Ages, a market cross symbolised the right of a location or community to hold a yearly trade fair. This right was granted by the king or emperor and was a source of income, as a tax – comparable to our VAT – was imposed on all goods sold. In many cases, this yearly trade fair took place on the day of the patron saint of the community. 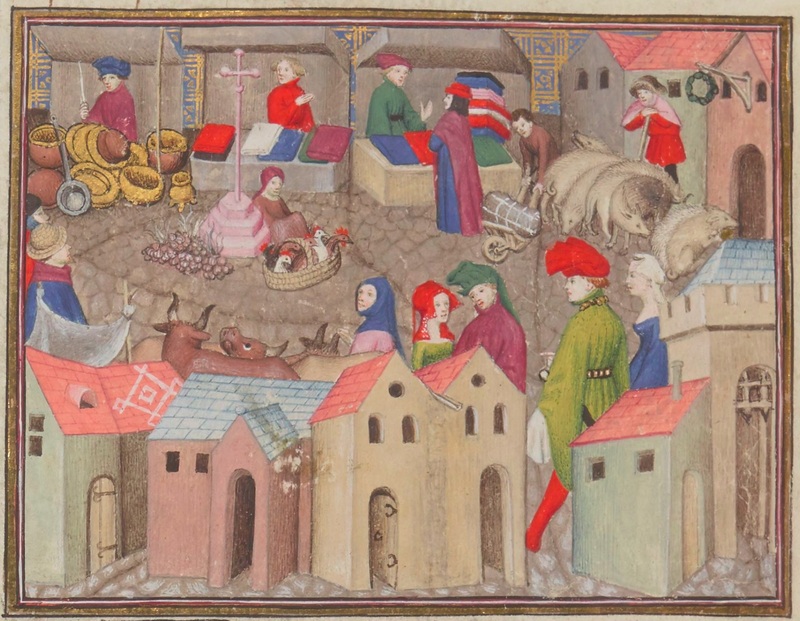 In most cases, this yearly market took place on the central market square in towns, or on the commons of villages, which was altered to have easy access for the large number of people attending. At the market cross, the rules of the trade fair were proclaimed, and the measures of length and weight displayed (as there were local differences). 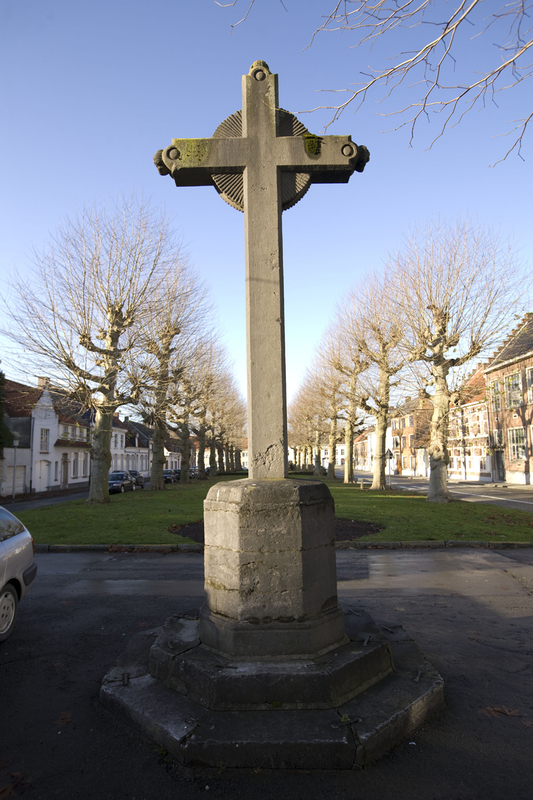 Today, there are only two market crosses preserved in Flanders, one in Sint-Lievens-Houtem and one in Ename. 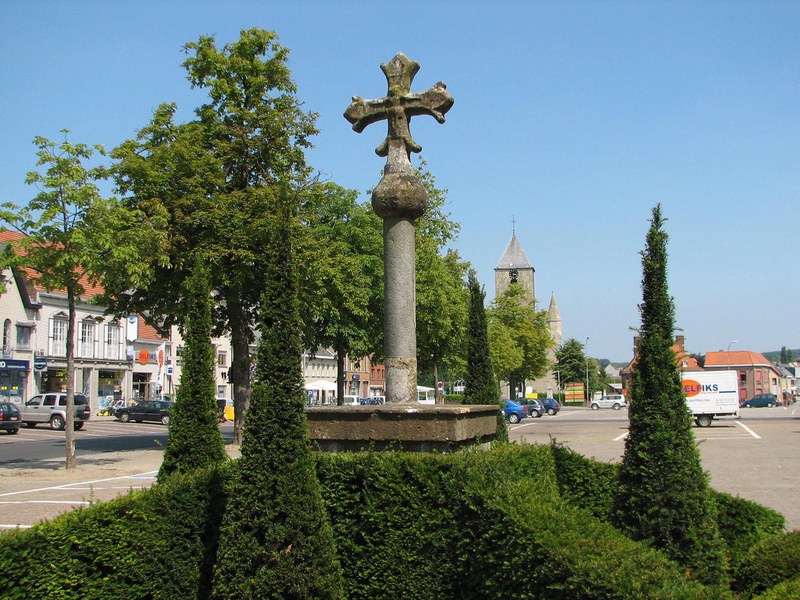 The Sint-Lievens-Houtem market cross from the 15th century is still linked to the yearly market – attended by about 50 000 people – that has been declared Intangible World Heritage in 2010. From medieval sources we know that this cross had a wooden precursor, probably from 1256 onwards. Yearly trade fairs in villages were typically linked to abbeys. 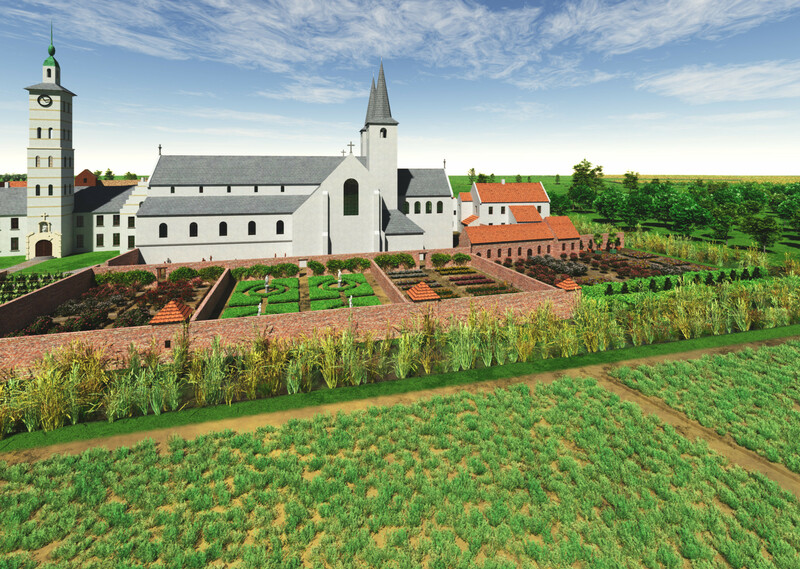 The Sint-Lievens-Houtem trade fair was organised by the Saint Bavo abbey of Ghent, on Nov 11 and 12, dedicated to Saint Livinus. 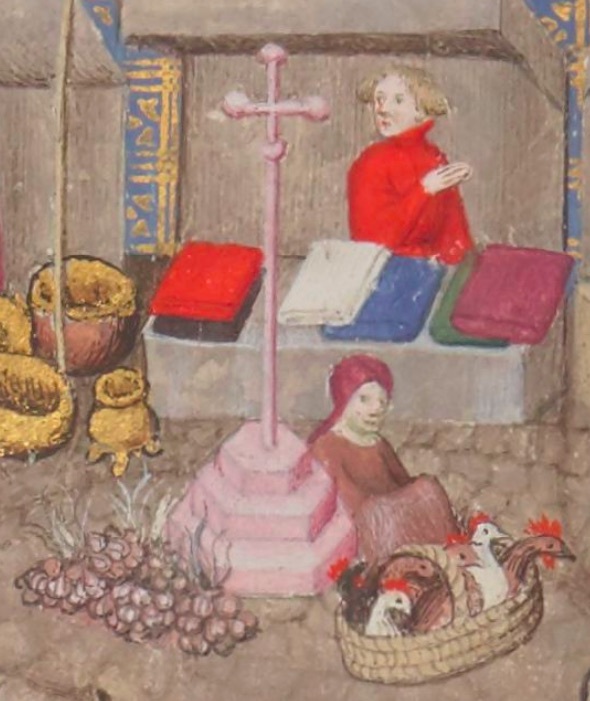 The sphere below the cross indicates that also the count of Flanders was supporting the market (which means providing physical and juridical protection and probably getting his share of the collected tax). In Ename, the yearly trade fair at Saint-Laurentius day (August 10) was established around 1000, when the trade settlement was flourishing. The right to hold a yearly market was transferred to the Ename abbey in 1063 when the trade settlement was replaced by the abbey. It was a major source of income for the abbey. 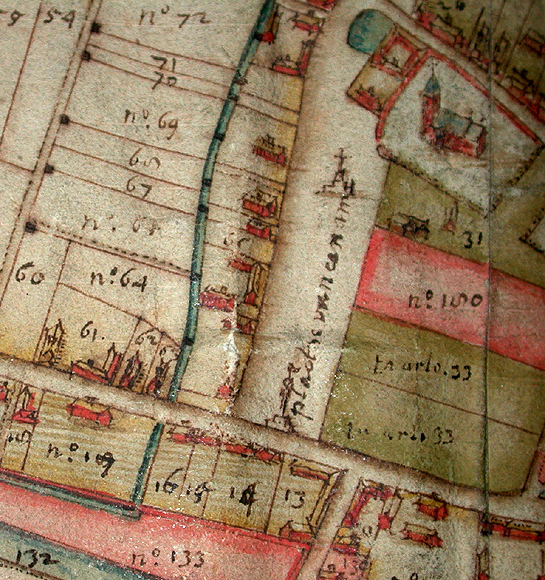 When the abbey was abolished in 1795, the trade fair continued, mostly as horse market. 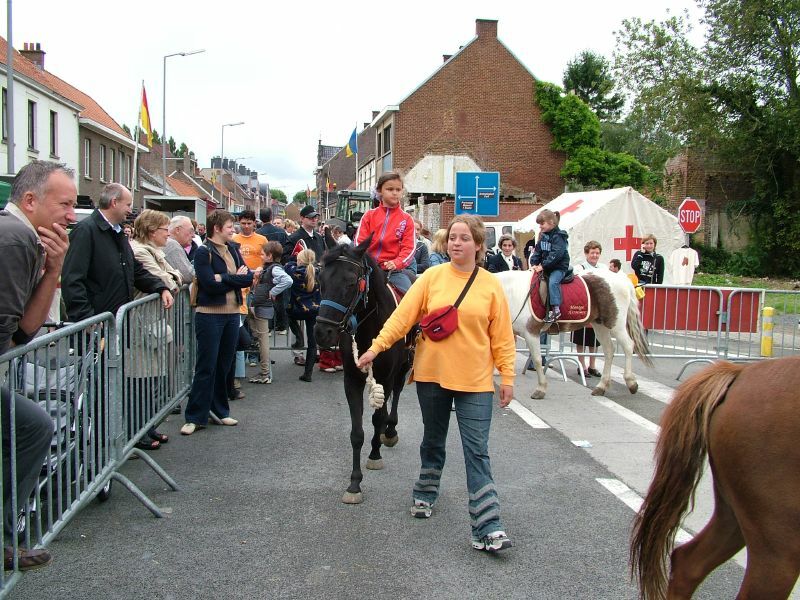 With the advent of tractors, the market disappeared in the sixties, but was revived as Feeste t’Ename, with horse riding demonstrations on Sunday and a horse market on Monday. Although the Ename market cross has been mentioned earlier, we only have depictions of it from 1596 onwards. 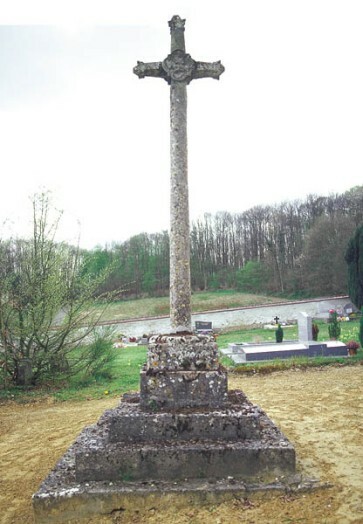 The current cross dates from 1778 (the cross itself could even be from the 19th century). But it is quite sure that a market cross was present in the centre of Ename in the 13th century, and probable already from about 1000 onwards. 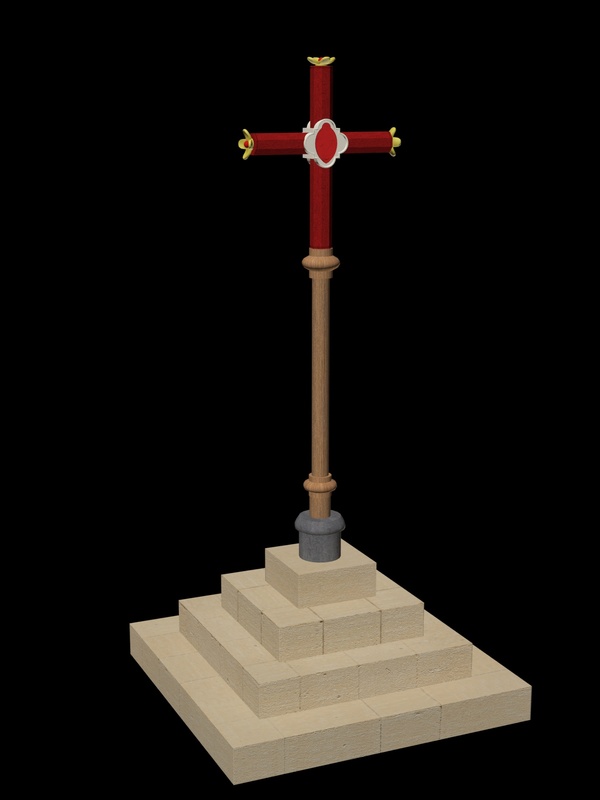 For Eham 1291 (the virtual reconstruction of Ename in 1291), we wanted to make a 3D reconstruction of the Ename market cross in that time. 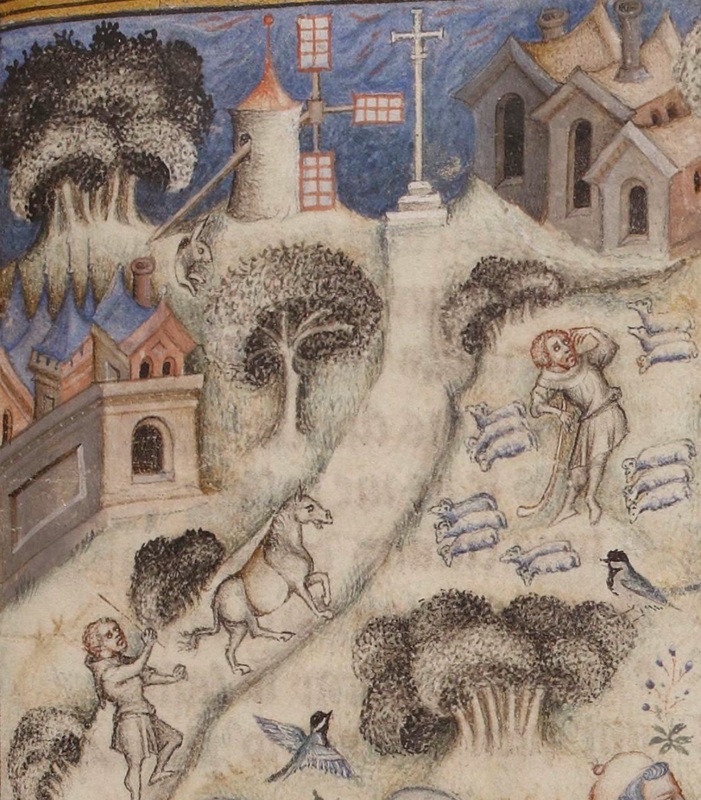 As a basis, we use one of the three depictions of a market cross in the Veil Rentier (illustrated around 1290), more precisely the market cross of Bauffe, which was located very close to the abbey of Cambron, today Pairi Daiza. 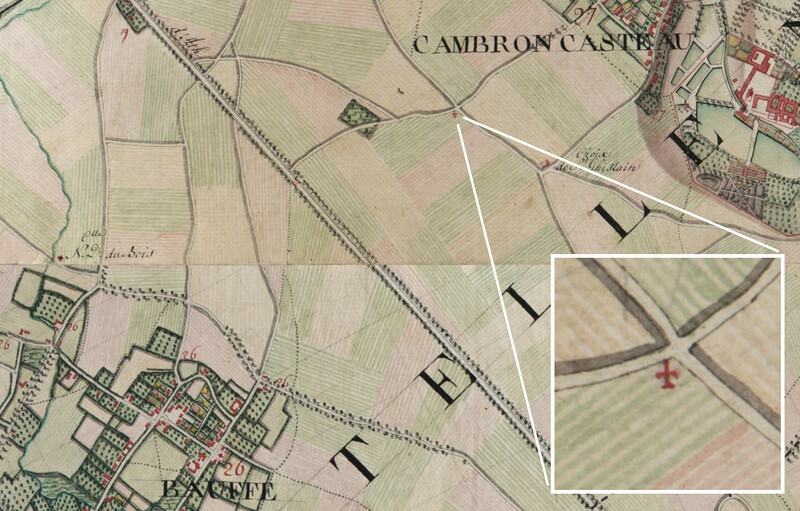 The road from Bauffe to the abbey is still called the Rue de la Croix and the market cross is depicted along this road on the Ferraris map (around 1775). 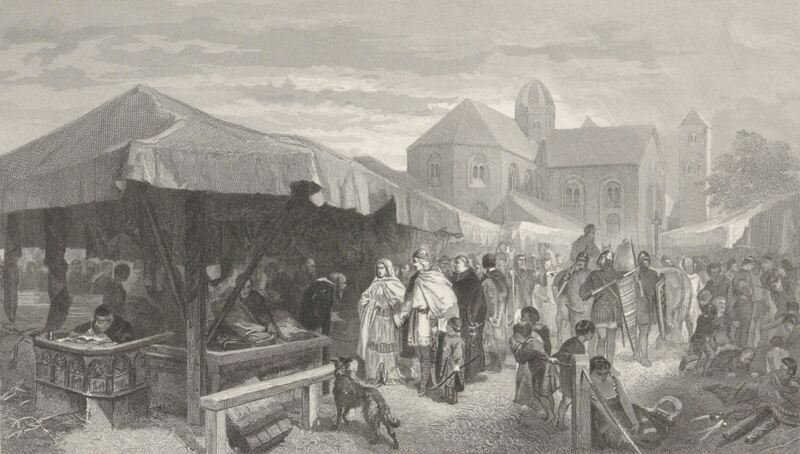 As it is clear that the market crosses in the Veil Rentier are made of wood and as there are no wooden market crosses preserved today (even not in museums), we have based the interpretation of the drawing from the Veil Rentier (see above) on the oldest surviving stone market crosses in Belgium, France and the UK. Analysis shows for example that the flower decoration of such crosses is very typical and always situated at the end of the arms of the cross (there is no perspective yet in the Veil Rentier drawings). We have chosen to partially paint the wood, as suggested by the Veil Rentier drawing (see above). On one side, the cross carries the image of Saint Saviour, on the other hand the image of Our Lady, which is symbol for the double denomination of the Ename abbey. The steps are made in the local Balegem stone. 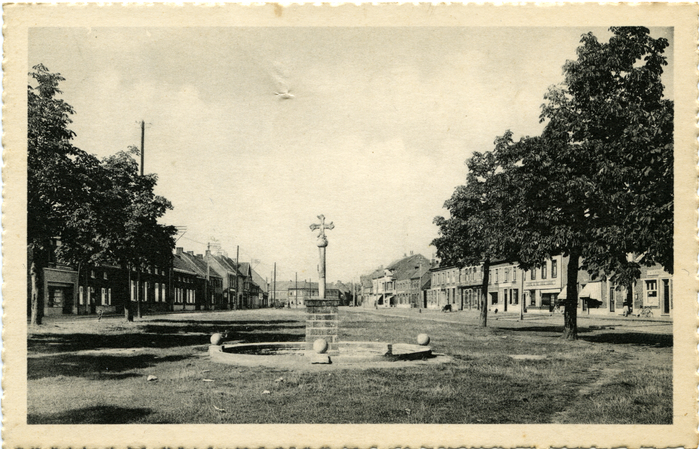 In medieval times, the market cross would have been positioned in the middle of the commons (in analogy with other places such as Sint-Lievens-Houtem). Today the Ename market cross is located at one side of the market square, as was already the case in 1661. When doing virtual restoration on a museum object, we try to understand the object and what happened with it. This third blog post about the Ename crosier, a Flemish Masterpiece on display in the Ename museum in Belgium, tries to reconstruct the chronology of the events that shaped the current museum object. 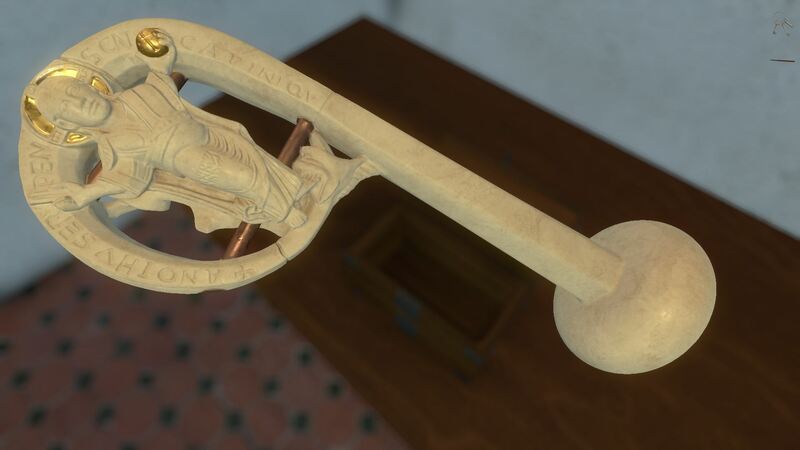 In the first blog post about this crosier, we showed in 3D how this crosier must have looked like when created around 1175 AD. Although the medieval artist, who cut this ivory masterpiece, has used some tricks to make it more sturdy, it is most probable that the the object gets broken at a certain moment between 1175 and 1390, as proven by art historian Elisabeth den Hartog. 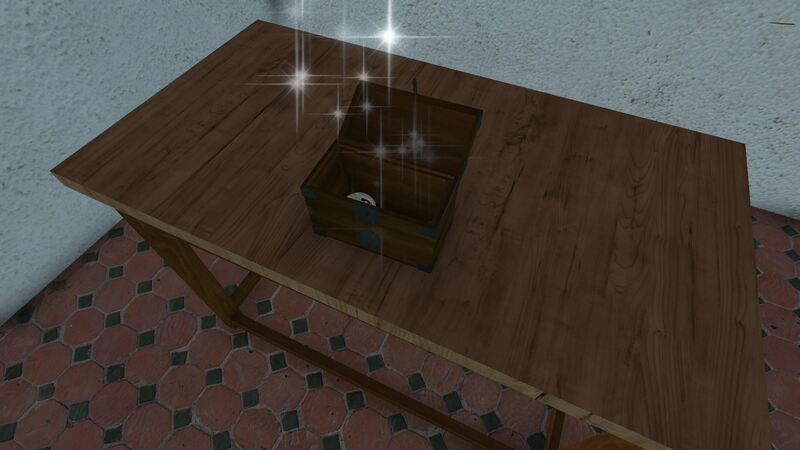 As the object is so intricate, simply falling by accident on a hard floor could have been the cause of breaking. Although we have no proof when this happened, we put this event in 1290 in our educational game Ename 1290. The broken pieces were put together by inserting two bronze bars through the middle of the object. To fit the lower bar, it was required to cut away the upper jaw of the dragon. The lower jaw was most probable still present. So we think the repaired crosier looked like this. probably the crosier has been used for many more years, until a moment that it was considered too old, too worn out, and out of fashion. 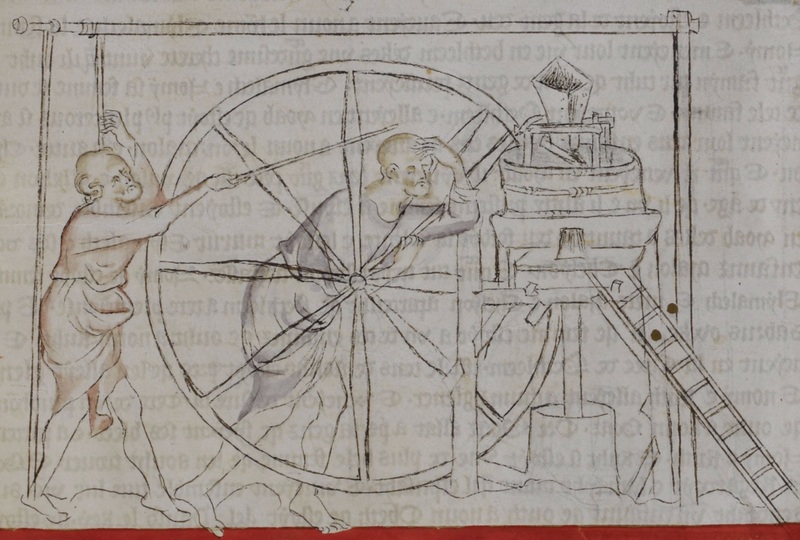 This moment lies probably at the end of the 14th century. At that moment, the monks decided to bury the old staff together with a deceased abbot, most probable Gerard Ghuise who died in 1393. His successor will have received a new staff, as the staff belongs to the abbey, not to the abbot. From 1379 to 1385, the revolt of Ghent raged over Flanders, causing many casualties and severe economic losses. In 1384, the last count of Flanders dies and Philip the Bold, his son-in-law and first Burgundian duke to rule Flanders, ends the revolt, restores order and revives the economy. 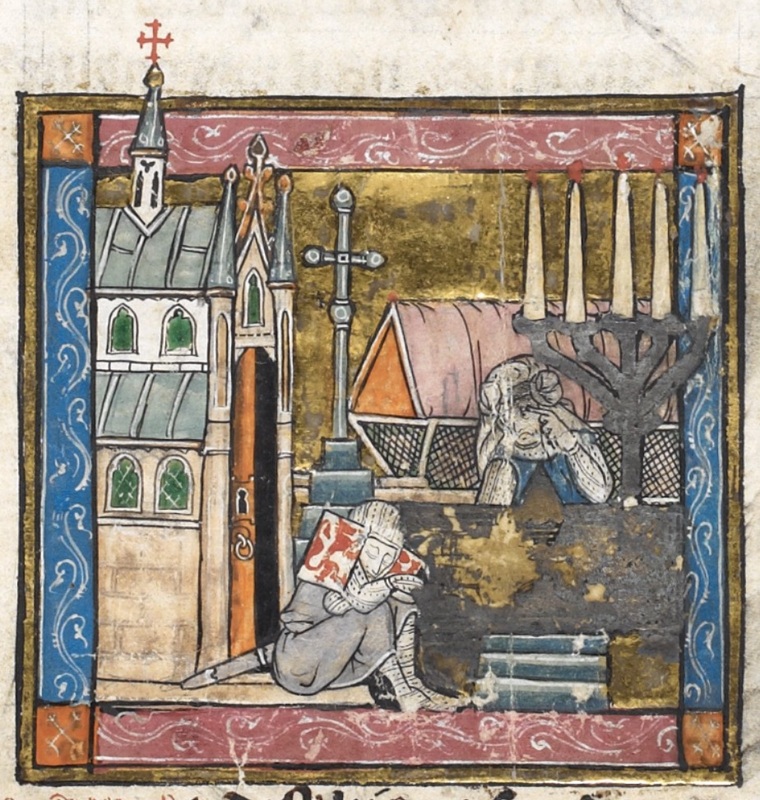 It is plausible that the Ename abbey could only afford a new staff for its abbot in that more prosperous time, as most of the 14th century was a very difficult period with famine (1315-1322), plagues (1346-1353) and war (1379-1385). There is however a possible second reason. 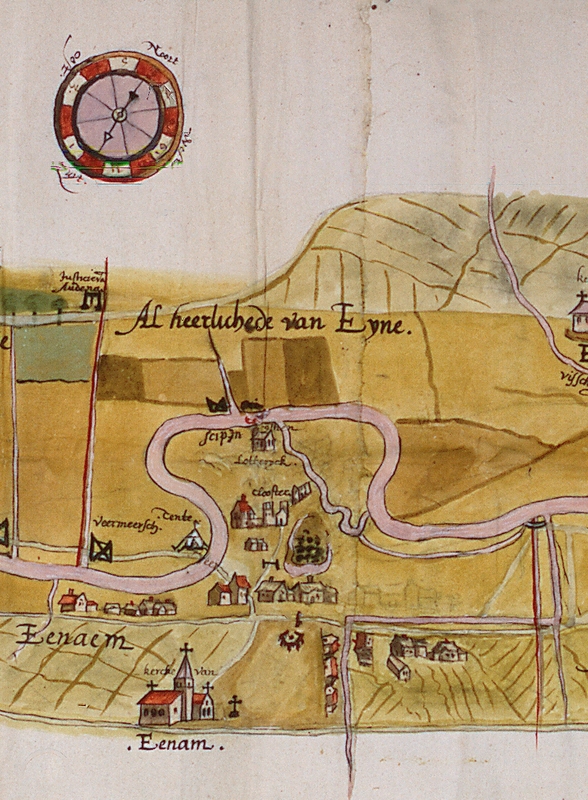 The Ename abbey was closely linked to the count of Flanders. 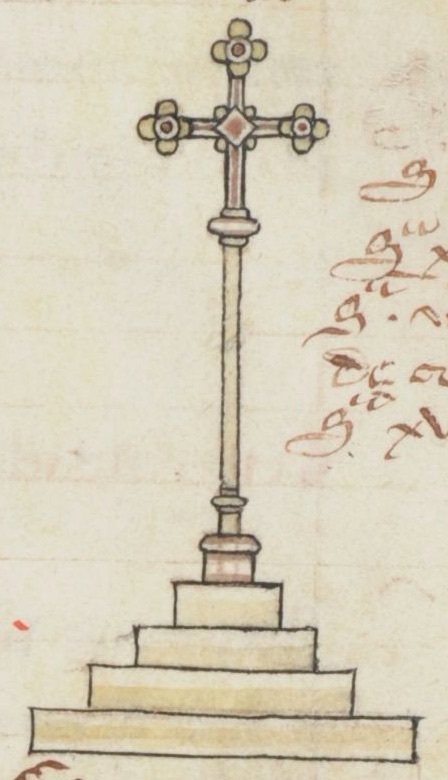 It is possible that the Ename crosier was donated to the abbey by count Philip of Alsace, when the new abbey buildings were inaugurated around 1175 (see part 1 of this extended blog post). When the Burgundian dynasty takes over in 1384, the Ename abbey has to do great efforts to establish a new relationship with the Burgundian court. Maybe a new staff symbolised the dependency on a new dynasty. Maybe the staff was donated by the Burgundian duke to the new abbot in 1393, as in most cases the abbot was proposed by the count of Flanders, at that moment Philip the Bold, Duke of Burgundy. Nearly 200 years later, the country is turmoil. The civil war between protestants and catholics in Flanders (1578-1592) creates extreme poverty and total lack of rule of law. Grave robbers open graves at the abbey site, to find precious metals or objects. They find the ivory crosier, break it and toss it away as ivory cannot be melted or reused. A possible reason for breaking the object is the presence of a golden ring above the knob, as can be seen in the example below and many other crosiers. When excavating the Saint Salvator church in 1995, archaeologists find the ivory crosier only a few meters away from the grave of abbot Gerard Ghuise. 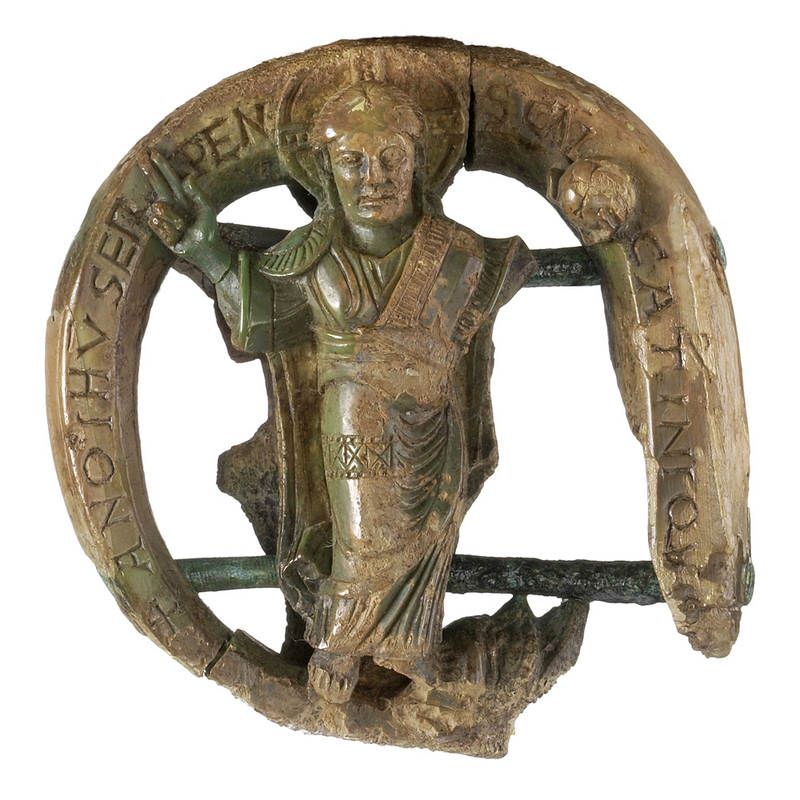 In 1998, the Ename museum opens and the Ename crosier is one of the top pieces on display, supported by the TimeLine application, showing the object in all detail and telling its fascinating story.